Eating in the library. Some libraries have an anything goes approach to it, while others try to manage it in different ways. 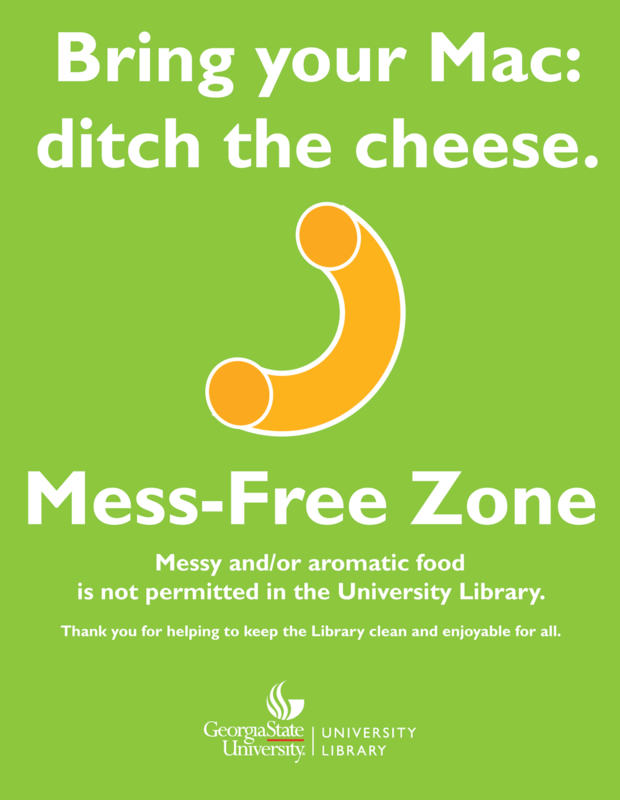 At Georgia State University Library, the staff were noticing that the food-anywhere approach was not really working for them. As Kaydee Wilson explains, “a lack of a clear and consistent food and drink policy prompted many students to eat hot meals at the Library, typically while studying with friends or working at computer stations. This lead to several issues… including stained and unsightly furniture at computer stations and seating areas, pungent and distracting food odors, as well as crumbs and left-behind garbage”. These posters won in the category of Print Advocacy Materials, $10,000,000 – $15,000,000, at the 2016 PR Xchange Awards. View the full listing of award winners (PDF).